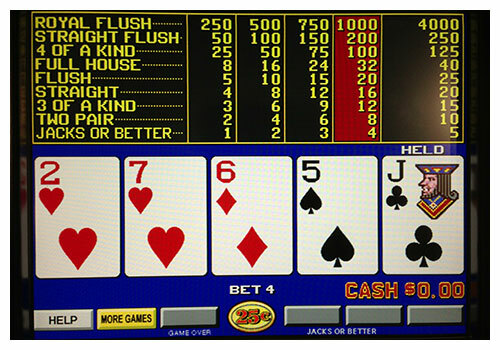 Video poker is a rather popular casino game that looks similar to a modern slot machine and is played an a computer monitor. When the game first came out, the machines were not all that popular but, eventually, they became a staple in gaming centers all over the world. The very first video poker machine was created and developed in the early seventies around the same time that personal computers emerged. Starting in the early eighties, casinos around the country began putting the games out on their floors where they became increasingly popular among customers were too intimidated by the tables of real poker games. In many ways the poker machines work the same way that electronic slot machines do. Players insert money or a preloaded gaming card into it, they receive a randomized hand and use the buttons on the screen to begin placing their bets, which are usually set at increments of one or five dollar amounts. The machine, after the draw, then pays out if the hand that the player had was one that consisted of a winning combination such as a pair, straight, flush, or etc. The amount of money that players can win each hand depend on how rare of a hand they end up with. Most hand combinations are exactly the same as they are in regular table poker and the odds of getting one are roughly similar as well. In most high end casinos, the video poker devices also offer some sort of progressive jackpot, in which a player is encouraged to continue playing the same machine and feeding in more money with the hopes of winning one of the unique bonuses. Since poker is more of a game of skill, rather than purely a game of chance like so many other casino activities, experienced and knowledgeable gamblers can eventually learn helpful tricks and skills which can help them win. Since the cards are dealt randomly from a computer generated deck of fifty two, the possible outcomes and combinations can sometimes be calculated to an extent. Good poker players will learn and develop helpful strategies to end up with an optimal hand. Just like in regular table-based poker, all of the payoffs that the machine spits out are based on ‘five card’ hands and their corresponding rankings. The best and highest hand of cards that a player can have is known as a royal flush and it consists of the ace, king, queen, and ten cards of the same suit. The second best hand, the straight flush, is similar to the royal but instead consists of any five cards of the same suit and consecutive order, such as 2, 3, 4, 5, and 6 of hearts. After the flushes is the ‘four of a kind’ which is basically just like it sounds with any four cards of the same rank like four kings of diamonds or four twos of clubs. Under that is the full house which is any three cards of one rank and any two of another. A flush is a hand which consists of any five cards of the same suit and is followed by three of a kind, two pair, and lastly, a pair of jacks. This entry was posted in Video Poker and tagged in How To Play Video Poker.